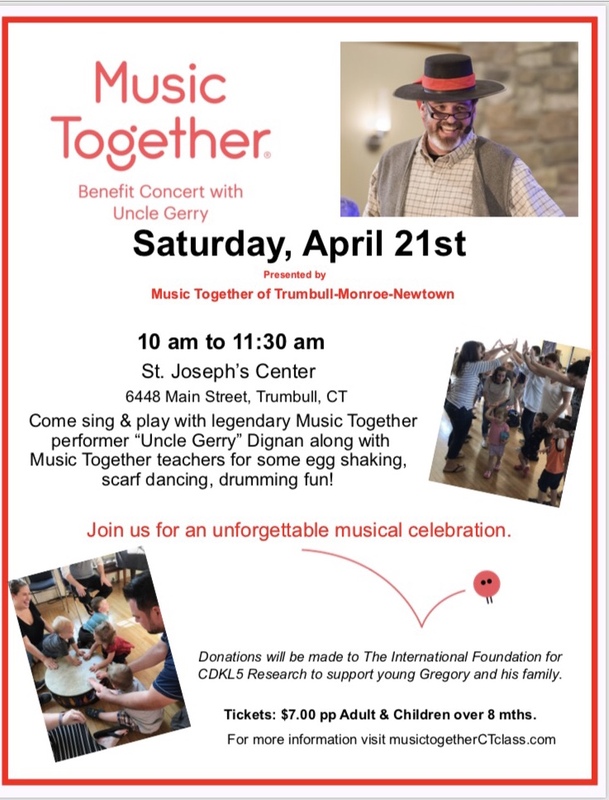 Recording artist “Uncle” Gerry Dignan and his wife “Aunt” Denise join with Music Together of Monroe/Newtown’s staff to bring you a spectacular singalong experience. Uncle Gerry has delighted families around the world at events large and small. In addition to being a fantastic Music Together ambassador who knows all our families’ favorite songs, Gerry is a skilled music facilitator, master of improvisation, and educator. He will sing and play his way into your hearts and create a community music event like no other. Get ready for some wiggles and giggles, egg shaking, scarf dancing, hand drumming fun! The event will be held on Saturday, April 21st from 10 am to 11:30 am in Trumbull at St. Joseph’s Center, who graciously donated the space. Tickets are $7.00 per person (adult & child over 8mths) online and $10.00 pp walk in day of event space pending. This event will be raising money for The International Foundation for Cdkl5 Research. This foundation funds global research to help individuals with Cdkl5 Deficiency Disorder and their families. It is considered a rare disease and there are 3 children currently diagnosed in CT.
“Gregory and I have been going to Music Together of Monroe/Newtown classes with Miss Julie since he was about 5 months old. A friend of mine, who also had a newborn at the same time, invited us to sign up for the Babies class. Even at that early age, I knew Gregory was developing at his own pace. When your child has disabilities, it can be hard to find activities that are accessible and inclusive. Music Together has been wonderful!